Magnetic locators are designed to detect the magnetic field given off by buried water distribution materials containing iron. This includes pipe, gate and curb boxes, manhole covers and septic tanks to name a few. Call us for help determining which locator is right for your job. Copperhead’s companion locator to their industry leading tracer wire, the ViperMag, features both passive and active locating with an included transmitter and optional inductive clamps so you can find just about anything. It’s also the only locator on the market with a built-in metal detector. Schonstedt locators all come with a 7 year warranty and are known to last longer than the competition. 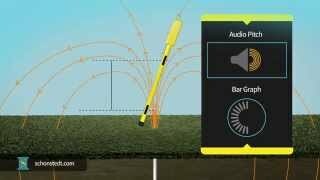 The 52Cx is designed to detect the magnetic fields of iron and steel and provide audible feedback that peaks when the unit is directly above the buried metal. Schonstedt’s GA-92XT model allows for single-handed operation with both digital and audio feedback for easy and accurate locating.